We have an extensive collection of materials on the United Evangelical Lutheran Church (UELC). These materials include district and convention reports, official correspondence, records of defunct congregations, church publications, individual church histories and information on institutions founded by that church body, such as Oaks Indian Mission and Trinity Seminary. The DAAL has both convention reports and some church histories for the American Evangelical Lutheran Church and the Danish Baptist Church. We house materials on a wide range of cultural expressions. Books on food and recipe books describe classic Danish recipes as well as their Americanized cousins. Our photo collection contains many photos that depict folk dancing and Danish modern design. The DAAL has materials documenting the annual Danish celebration of American independence at Rebild and a broad array of Christmas annuals. Our holdings contain extensive information on both Dana College and Trinity Seminary. The materials include catalogs, yearbooks, literary magazines, school newspapers and lists of students, professors and staff. The DAAL also has materials on some folk high schools founded by Danish immigrants. There is also material on children’s homes and Grand View College in Des Moines. We are preserving exceptionally rich collections of correspondence. The Hansen-Mengers collection contains 16,000 letters dating from the late nineteenth to the late twentieth century. The Jorgensen and Walker-Johnson collection are nearly as extensive. These collections and others include regular correspondence with family members both in Denmark and the U.S. Many of these letters are in Danish, but have now been translated into English. We also have several detailed diaries, both in Danish and English. We are the official repository of records of the Danish Brotherhood and Dana College. Information on other organizations, including athletic clubs, women’s associations and the founding of the Danish Immigrant Museum, now called the Museum of Danish America (MoDA). Some genealogical information is found at the DAAL. The Vig collection, which documents the histories of residents of Washington county, and the P.C. Jensen collection, which contains biographical and professional data on many United Evangelical Lutheran Church (UELC) pastors can be accessed on our Digital Archive. You can search our extensive Danish Brotherhood and obituaries collections in house at the DAAL. Our holdings include the business records of family farms, ranches, construction companies, retail stores and others. The DAAL has been designated the repository of all music materials by our sister Danish American organizations. 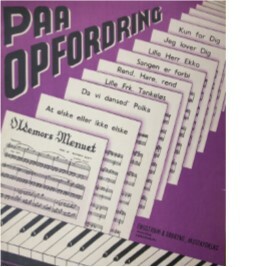 Our music collection contains records, tape recordings, sheet music, hymnbooks and Danish songbooks. Extensive collections of material that belonged to the great Danish heldentenor, Lauritz Melchior and the popular Danish pianist, Victor Borge are also included. Our library contains nearly 13,000 books, both in Danish and English. They represent a broad range of cultural themes, from art and architecture to biography and cuisine. There is an extensive collection of books published by Danish language presses, such as the defunct Lutheran Publishing House in Blair, Nebraska. We have both classic and contemporary Danish literature and a large collection of family Bibles. There is a substantial number of books dealing with Danish immigrant history and religion, including accounts of several North American communities with large Danish populations. We seek books that were used by Danish immigrants, whether or not they were written in Danish. The DAAL’s collection contains more than 400 types of periodicals. The largest concentration is on church publications. We have the most comprehensive collection of Den Danske Pioneer, a Danish language newspaper published since the 1870s. We also have a nearly complete collection of the Danish Brotherhood magazine, and a number of almanacs and Christmas annuals.